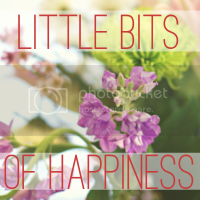 I am linking up with Stephanie for her Little Bits of Happiness post! That face | Sleeping with her Trigger. Makes me cry almost every day. You are so welcome mama! It's all very true! And I definitely will, good luck with the move! Your daughter is such a cutie and I really love her towel lol. May I ask were you got it from? Thank you! We got it from babies r us. They actually had two Minnie ones, the one we got and then one that looked like a poncho! love her minnie towel, she's too cute! she is such a cutie! love this post. and i love the new look, lady! !